"An easy roast beef sandwich with local origins in Buffalo, New York. Kimmelweck rolls are hard kaiser-type rolls covered in coarse ground salt and caraway seeds. This recipe transforms regular rolls into the traditional weck rolls." Warm the au jus sauce in a saucepan over medium heat. Add the roast beef and let it warm up at the same time. While the meat is soaking, place the rolls on a baking sheet with the cut side down. Brush the tops lightly with water and sprinkle with salt and caraway seeds. Bake in the preheated oven until rolls are toasted, about 10 minutes. Serve the sliced beef on the rolls with the au jus and horseradish on the side. Almost perfect! I worked in a restaurant known for their beef on weck and the trick is to dip the cut rolls in the au jus just a bit before serving so its not so messy. Between the salt in the au jus and the bun, it was just too salty. I'm sticking with Italian beefs. Great recipe, and a great way to make kimmelweck rolls for people who may not be able to find them where they live! this is a really good, quick convenience recipe!!! I esp. like the part about making the plain kaiser rolls into kimmelweck rolls. My husband and kids enjoyed them. Thanks! 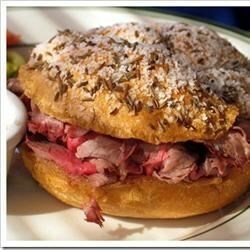 We dip the bottom side of the top roll in au jus and just serve with horseradish. This recipe was just what I needed. My Buffalonian boyfriend was overjoyed :) Thank you. These is a simply but tasty and hearty recipe! We really enjoyed this dish. My husband is a huge fan of French dips and I loved making it with the deli roast beef.